(Beirut) – Lebanese authorities should conduct an independent, thorough, and transparent investigation into the deaths of Syrians in military custody and allegations of torture and ill-treatment in detention, Human Rights Watch said today. On July 4, 2017, the Lebanese military issued a statement saying four Syrians died in its custody following mass raids in Arsal, a restricted access area in northeast Lebanon where many Syrian refugees live. On July 14, Human Rights Watch received credible reports that a fifth Syrian detainee had also died in custody. A doctor with expertise in documenting torture reviewed photos of three of the men provided by their family lawyers to Human Rights Watch, which showed widespread bruising and cuts. He said the injuries were “consistent with inflicted trauma in the setting of physical torture” and that “any statement that the deaths of these individuals were due to natural causes is inconsistent with these photographs.” Human Rights Watch also spoke with five former detainees, who said that army personnel beat and ill-treated them and other detainees. A military officer told Human Rights Watch that the army was investigating the deaths and would publish its findings. On June 30, the Lebanese army announced it had raided two unofficial refugee camps in Arsal that day, and was met with suicide bombers, a bomb, and a grenade, resulting in the injury of seven soldiers. On July 15, the army released a statement saying that it detained 356 people following these raids. It referred 56 for prosecution and 257 to the General Security agency for lack of residency. A humanitarian organization official told Human Rights Watch thatchildren were among those detained. The Lebanese army regularly conducts raids on unofficial refugee camps in Lebanon, but has not responded to questions from Human Rights Watch about the purpose of these raids. The raids came amid calls from Lebanese politicians for the return of refugees to Syria and reports of an impending military operation against armed groups on the Syrian border near Arsal. Human Rights Watch has not been able to confirm reports that Syrians died during the raids themselves, but a source in Arsal said the municipality received nine bodies, not including the five men who were reported to have died in custody. The army’s July 4 statement said that four detainees who “suffered from chronic health issues that were aggravated due to the climate condition” died before being interrogated. It identified them as Mustafa Abd el Karim Absse, 57; Khaled Hussein el-Mleis, 43; Anas Hussein el-Husseiki, 32; and Othman Merhi el-Mleis. The army did not specify where it had detained them. Human Rights Watch spoke with a family member and a close acquaintance of two of the deceased, who said that they had no known serious health conditions. Both said that the army gave no reason for the arrests and did not notify the families of the deaths. On July 14, Human Rights Watch received reports that a fifth Syrian detainee, Toufic al Ghawi, 23, died in detention after the army transferred him to the Elias Hrawi government hospital. A witness in Arsal who saw the body before burial said, “Toufic didn’t look human anymore. His flesh was torn apart.” Human Rights Watch has not received photographs of the body. Additional evidence supports the allegations of abuse and torture during the arrests in Arsal and at military detention facilities. A witness in Arsal told Human Rights Watch that he had seen 34 former detainees with marks on their hands, legs, and backs, and in one case, on a former detainee’s head. Human Rights Watch spoke with five former detainees who said they were mistreated, physically abused, and denied food and water, along with scores of other detainees during four to five days of detention without charge before being released. Human Rights Watch wrote to the military on July 10 to verify the number of those arrested, injured, or killed during the army raids; those still in custody; and the conditions of their detention, but has not received a response. Human Rights Watch also requested permission to enter Arsal to interview witnesses, but has not received permission. An army officer told Human Rights Watch that the army was not allowing “media organizations” to enter Arsal. Human Rights Watch shared its findings with the military and military prosecutor. Under international law, Lebanon has an obligation to investigate deaths in custody and hold those responsible to account. Human Rights Watch and local human rights organizations have long documented reports of torture and ill-treatment by security services including the army. Impunity for violence is a recurring problem in Lebanon. Even when officials have initiated investigations into deaths, torture, or ill-treatment, they have often not been concluded or made public. Human Rights Watch is not aware of cases where military personnel have been held to account. The photos reveal widespread physical trauma of the upper and lower extremities. The lack of defensive wounds suggests that these injuries were inflicted while the victims were restrained or otherwise incapacitated and the distribution of these injuries are consistent with inflicted trauma in the setting of physical torture. Several of the photos are consistent with lacerations caused from being suspended by the wrists. It would be reasonable to conclude that the deaths of these men is the result of in-custody violence, although the precise cause of death cannot be predicted based on the information and photographs submitted. Any statement that the deaths of these individuals was due to natural causes is inconsistent with these photographs. Human Rights Watch spoke with five former detainees from Arsal who said they were detained without charge for four to five days. They said soldiers handcuffed them, hooded them with their shirts, put them on the ground in the sun, and stomped or hit anyone raising their head. “I moved my head up slightly, and immediately a soldier hit me with his boot,” one man said. 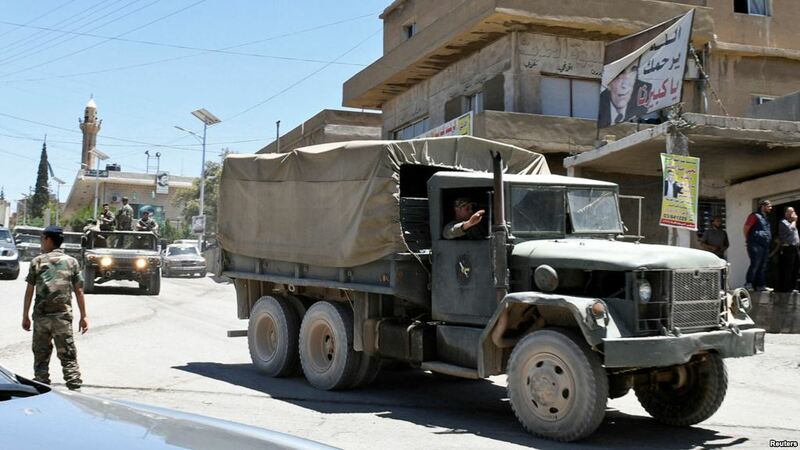 The men said soldiers then loaded them onto trucks “one over the other, as if they’re shipping potato bags,” and took them to multiple detention sites including Rayak Air Base in the Bekaa Valley and the military intelligence and military police bases in Ablah. At Rayak Air Base, they said, army personnel held more than 100 of them in one room overnight, denied them food and water, and did not allow them to use the bathroom. “They would beat whoever asked to go to the bathroom,” said a former detainee in his 60s. The men interviewed said they were finally transferred to General Security, the agency in charge of foreigners’ entry and residency, who did not mistreat them and released them. The former detainees said that the army never told them why they had been detained. One former detainee, interviewed on July 11, said: “I had to leave my son behind [in detention]. To this day, I don’t know what has happened to him.” Lebanese law limits pre-charge detention to 96 hours. Human Rights Watch also reviewed medical reports for three of the deceased, dated July 1 and 2, and prepared by a forensic doctor at the request of the general prosecutor, concluding that they had suffered heart attacks and a stroke, and that the bodies did not show marks of violence. A lawyer representing the families said she had received permission from a Judge of Urgent Affairs for a forensic doctor to examine the bodies, conduct an autopsy, and take medical samples to ascertain the cause of death. After she took the medical samples to the Hotel Dieu hospital in Beirut for analysis, the lawyer said, Military Intelligence personnel there demanded she turn them over, by order of the Military Information Directorate. She handed them over after the general prosecutor, Samir Hammoud, instructed her to do so. Following the military’s intervention, she said that the X-ray, CT scan, and autopsy results have not been released to her or made public. The investigation into the men’s deaths is now before the military court, the family’s lawyer said. Human Rights Watch has previously raised concernsabout the independence, impartiality, and competence of the Military Tribunal, where the majority of judges are military officers who are not required to have law degrees, and where trials take place behind closed doors.